Time flies . It is my last weekly update to all as club President. It is the last meeting of 2017-18 – 28/6. For this meeting we have 19 members, PPs. 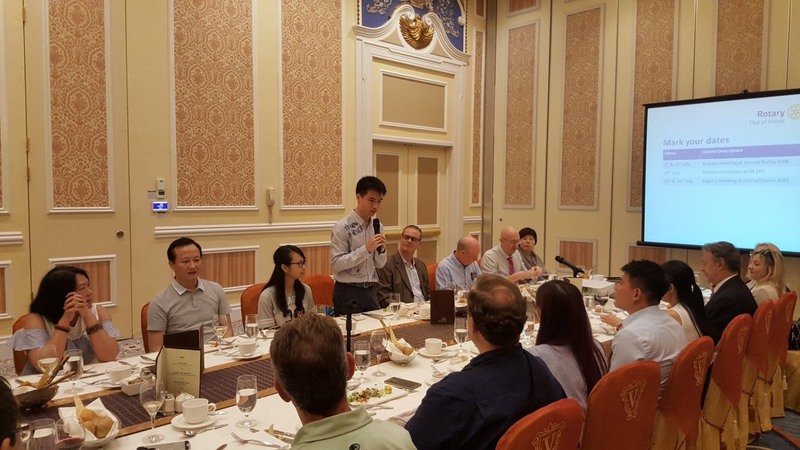 Synthia Chan, Fred Palmer, Teren Cheong, Guy Lesquoi, David Shelton-Smith, Ip Pui Fai, Stella Kan, PE Elvou Sou, Rtns. 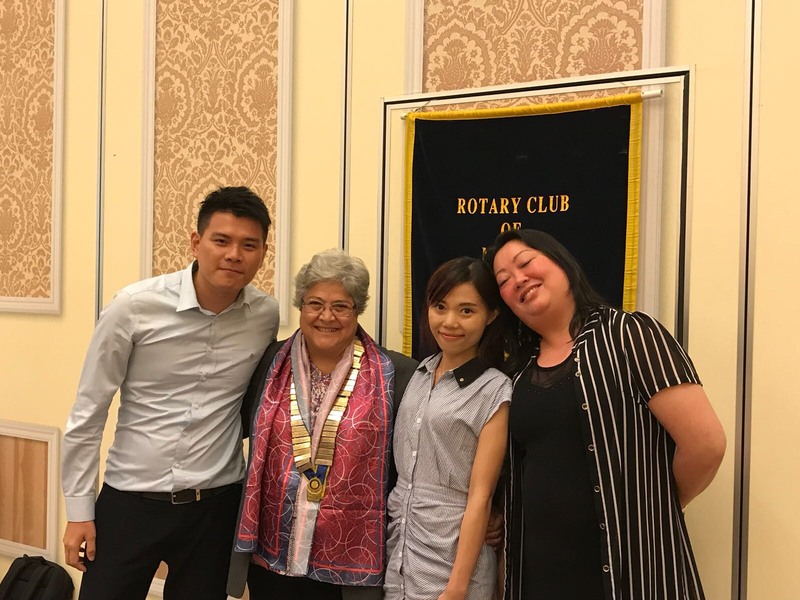 Phillip Lai, Margaret Bai, Ignacio Marcovecchio, Pauline Lai, João Pinto, Aris Tam, Marc Vernaeve, Andy Lam, Yuko , Sally Lei , Matthew Wong, 2 rotarianne , Vicky and Peggy, Guy guest his mother in law, a visiting Rotarian Ramiro Valdemane and his friend Aaron and Kula and myself all together we were 28. I share my participation in Toronto Rotary International Convention 23-27. 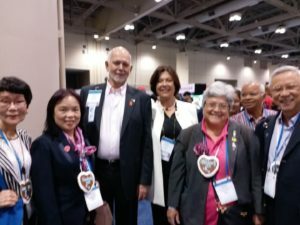 Have a chance of meeting RI 2018-19 President. It is a kind person allow to take a picture with Macau team. Youth Exchange – Our UK exchange students Ken and Cherry came to our meeting to introduce themselves and share their expectation and the preparation made for the trip. They will depart next Friday 13/7 to UK. And it is plan the Workshop to be held 30/6 . Will have sessions of Introduction if Rotary, Interact, Youth Exchange and Sexual Harassment Prevention specially designed for. This workshop is for YE students, parents, teachers, rotarians, and related District Officers. 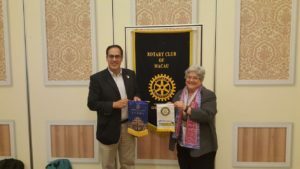 The visiting Rotarian from Seattle introduce himself and his club projects and look for some joining project. And it is one more event – induction of 2 new members. I introduce Matthew and Synthia introduce Sallie. The new members and the proponents. As always a good fellowship. Before closing I thank and send my appreciation to each and everyone for your advice, support and generous donation. It was my privilege to serve the club at 2017-18 – Rorary : Make a Diference President and has been a wonderful, fulfilling and enjoyable experience for me. Together we have achieved many meaningful humanitarian services projects , increased contributions to the Rotary Foundation, strengthen our club foundation with new members, Phillip, Sallie and Matthew, but unfortunately we list our dear Lei Loi Tak passed away peacefully on 21/02/2018 and 3 members resigned Perry Lam, for family reasons, Ignacio Marcovecchio for personal reasons and Raymond Lo for professional reasons. I will like to take this opportunity to thank their contribution to the club and wish all the best and welcome to join our activities, projects. 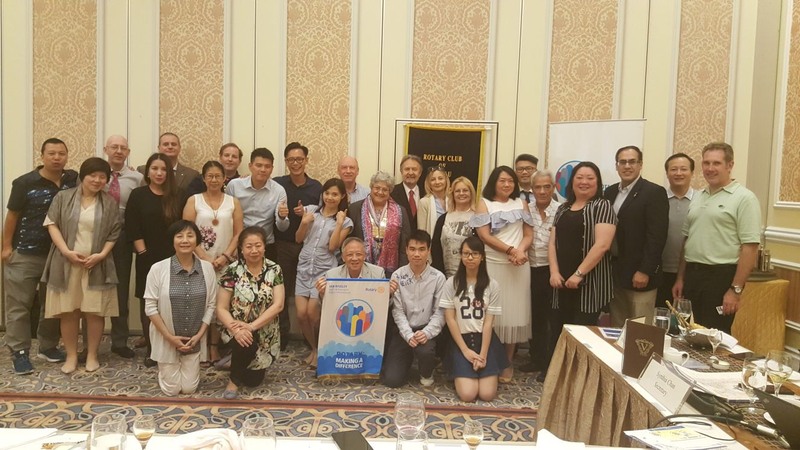 July/5 is the first regular meeting of new Rotary Year 2028-19 be the inspiration. Please come to support and give encouragement to our young President Elvo Sou. Come and join us to be the inspiration. 5th July First meeting of 2018-19 at Conrad – Be the inspiration.